That’s kind of you. Please see my policy on Blog Awards at the top of the page. What I like about this post is that it gives of a glimpse of something we might otherwise have missed. Thank you. I’m not going to lie, I shed tears writing it. Unless you’ve been an exchange student (or lived/studied abroad) you can’t appreciate the depth of the schism that has been created in our lives. We are forever in parts. I really did get the pain and I am sorry. I am so glad you wrote it though. Go through it. We don’t get over it, I’m afraid. I’ve been home a long time (as you can see by my hair! ), but I’ve been gone from home just as long. 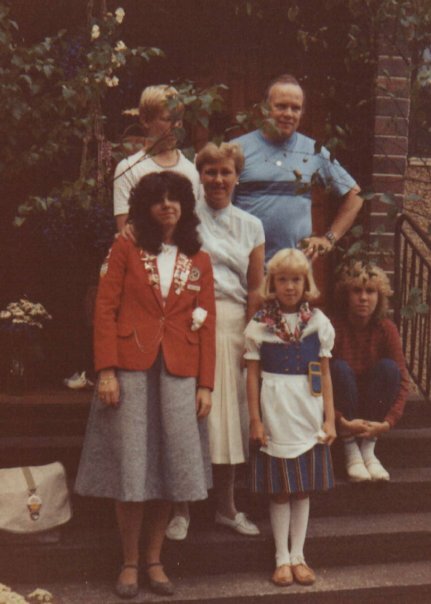 My family hosted a Finnish exchange student when I was a kid. I’m not sure how it worked out, but she landed in a Finnish home. She was my sister for almost a year. Great memories. Have you been in touch in the intervening years? We did for about 5 years by letter. After that we were 18, starting our lives. She was very reserved. Now we get a picture here and there. Did you eat pulla while you were there? Ojanpera = “trench bottom!” Your ancestors must have lived in some sort of a declivity? Brilliantly observed. I think it’s important to recognise that it cuts both ways. Yes. I miss the students I’ve hosted, as well. This is all so truth (and somewhat hurtful), it brought me to tears. I’ve just returned to ‘home’ after an amazing year abroad with Rotary, and agree so much with what you wrote. A piece of me is missing, and it’s hard to accept I will never get it back. Such a sweet feeling to have gone on exchange, and bitter feeling to have come back. Very well written, thank you for posting it! You’re welcome. Life does go on. You fit in with your friends and family again. There is always a piece that is ‘elsewhere’ though, and I don’t think it ever goes away. Where have you left a painful piece of your heart, Aline? Love this! My daughter just found out she’s going to France next year (August – ish). I will always think about the “missing pieces” of which you speak. Happy and sad, lost and found… Really great post. This just reminded me of my entire journey as a part of the Rotary Youth Exchange Program. You really hit it all on the head. Leaving really does break your heart. Lord knows I needed a million ears and hugs when I got back. At the same time, my heartbreak also comforted me in a way, because it validated my year in that it let me know I had accomplished what I set out to do – become part of another culture, and make a new place home, and new people family. How’s it going? Are you ‘home’ yet? Yeah, that never goes away. 🙂 My house is overflowing with things from Finland: glassware, linen, woodwork, etc. Hhahaha My room is filled with all my memories as well. It’s funny the world it opened me up to! Just being able to talk to you and have such a massive common ground is quite incredible! Exchange students all over the world live very similar lives. I find it interesting to read letters from students all over the world- each stage of the exchange seems so similar, even in different countries.